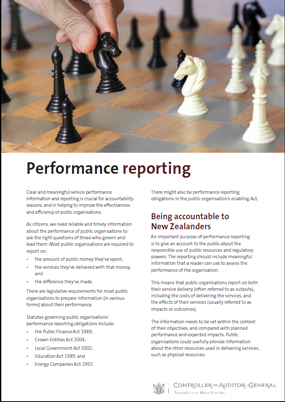 Clear and meaningful service performance information and reporting is crucial for accountability reasons, and in helping to improve the effectiveness and efficiency of public organisations. There are legislative requirements for most public organisations to prepare information (in various forms) about their performance. There might also be performance reporting obligations in the public organisation’s enabling Act.